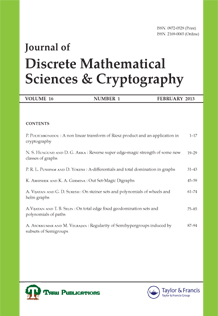 The Journal of Discrete Mathematical Sciences & Cryptography is a refereed journal following two-referee system which is currently being published in one volume per year of three issues in the months of April, August and December. However, from 2007 it will be published in one volume per year of six issues in the months of February, April, June, August, October and December alongwith the Online version. Original research papers, survey articles, books reviews, dissertation abstracts etc. devoted to all theoretical and applicable topics in Discrete Mathematical Sciences, Cryptography and related areas are considered for publication in this journal.